A new game based educational resource is now available which helps frontline healthcare staff to improve their knowledge and confidence when dealing with emergency situations outside the workplace. Health professionals may encounter situations outside their usual working environment where their skills could help to save a life. But administering first aid in an unknown environment can be a dauting prospect, and staff may lack confidence to assist in an emergency. 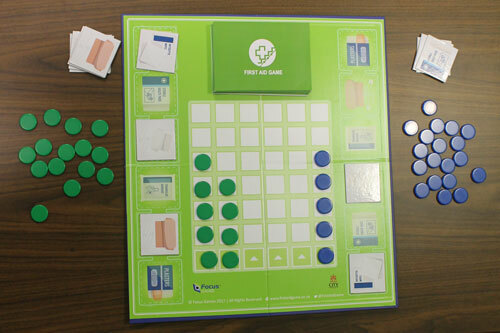 The First Aid Game has been developed in a collaboration between senior academics from the School of Health Sciences at City, University of London, and Focus Games Ltd, specialists in educational games for healthcare training. It is designed to help all grades of staff improve their confidence around managing an incident, providing first aid and caring for injured people outside of their workplace. This is the third board game for health and social care professionals which has been developed at City, University of London in collaboration with Focus Games Ltd. The First Aid Game follows the already successful Drug Round Game and Drug Recovery Game. "At City, University of London’s School of Health Sciences we pride ourselves on providing excellent and innovative education to our students and health care professionals. Serious games can have a significant impact on learning and when designing the First Aid Game the focus was on making learning fun whilst providing an evidence based teaching tool. This resource, developed by our senior academics, continues our tradition of game-based learning, and will encourage students to develop their skills and confidence in the crucial area of first aid." The First Aid Game leads players through four common emergency scenarios – road traffic collision, scald, choking and chest pain, challenging them to think about safety, prioritising casualties and incident management to provide safe and effective first aid. Questions and scenarios in the game are designed to stimulate discussion, encouraging players to share knowledge and experiences and to learn from each other.